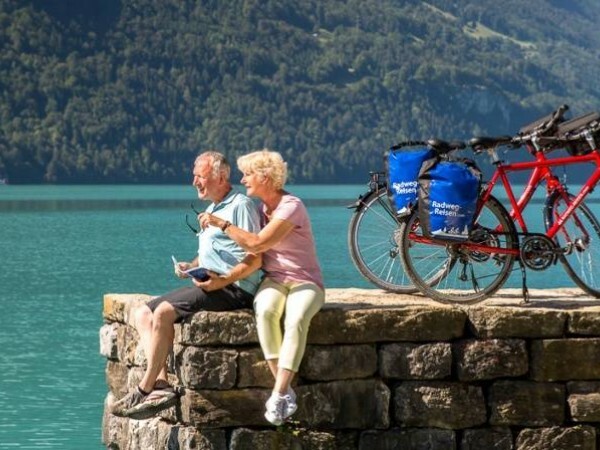 This easy cycling tour along the Swiss lakes spans from the Mediterranean flair of Lake Constance to the Churfirsten Mountains. You will experience the Schaffhausen Rhine Falls on an exciting boat trip, get to know the cosmopolitan city of Zurich on the lake of the same name and cross Walensee at the foot of the Churfirsten Mountains. In the Rhine Valley you will be treated to excellent wines and finally you will take a train to the Appenzeller Region where a picture book landscape awaits you. You will spend the end of your trip on the beautiful Lake Constance. After breakfast, it’s a short cycle ride to the Rhine Falls, one of Europe’s biggest waterfalls. You can get a boat right up close to the mighty roar of the water. Next, you follow Glatt Valley, which takes you to Zurich, Switzerland’s fascinating and very cosmopolitan city. It unites tradition with modernity and its unspoiled historic quarter is very inviting, thanks to the many cafes and bars here. You cycle along the northern bank of Lake Zurich along the so-called golden coast to Rapperswil. Take a break here and go up to the old castle. From there you have lovely views of Lake Zurich and the countryside. From Rapperswil, you cross the lake via the dam and then cycle along the opposite bank a bit further to the small town of Lachen. The Linth Canal, an artificial waterway between Lake Zurich and Walensee lake was built at the beginning of the 19th century to prevent flooding from the Linth and its tributaries.In Weesen you go on board a boat which takes you to Walenstadt, where you stay overnight. The Churfirsten rise high up over Walensee Lake – which is perfect for swimming. 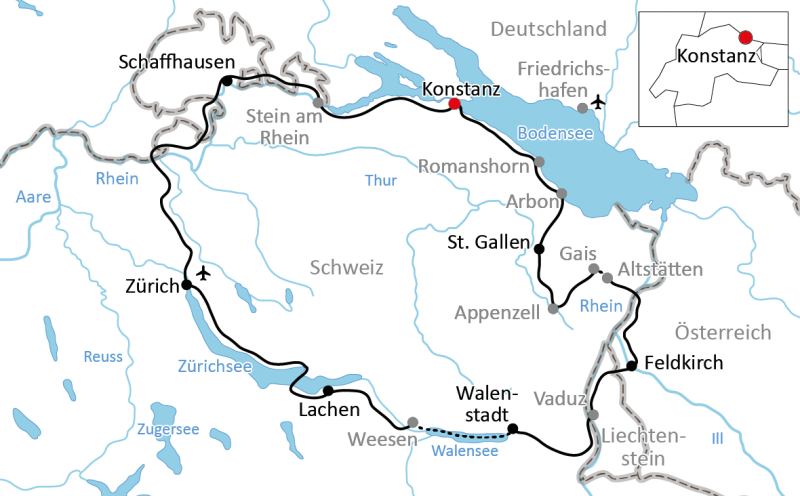 Today you’re going to be out and about in three different countries: After only a few kilometres, you reach Alpenrhein Valley, which you follow to the Principality of Liechtenstein.After about 25 km you will have pedalled through the entire length of the country and are at the border to Austria. From here it’s just a short cycle to Feldkirch. You cycle along the Rhine for a while and then a rack-and pinion train takes you up to Gais in Appenzell. Mountain pastures and cows characterize the pretty scenery on your way to St. Gallen. The Abbey Church library is considered one of the most important historic libraries in the world. It is home to about 160,000 books – one of which is the oldest German book. Enjoy the downhill stretch to Lake Constance and your arrival near Arbon. Following the banks of the lake almost all the way, you cycle through apple orchards and the small towns of Arbon and Romanshorn back to Constance. This stretch is flat and easy to cycle, unless in a stronger westerly wind. You will frequently pass places where you can go swimming and refresh yourself in the lovely cool waters of the lake. home or extend your stay. The route runs mainly along its own cycle paths and separate cycle routes. The route is mainly flat but in Appenzell there it is a little bit hilly. The 3 Lakes and 4 Countries cycling holiday includes the daily transfer of luggage to the next hotel and local support if required.